Some people are capable of being indebted to others without allowing this to bother them. These people understand that it’s normal for people to owe one another and that is simply a part of life. Other people struggle when they feel beholden to someone else, and really try to avoid this at all costs. 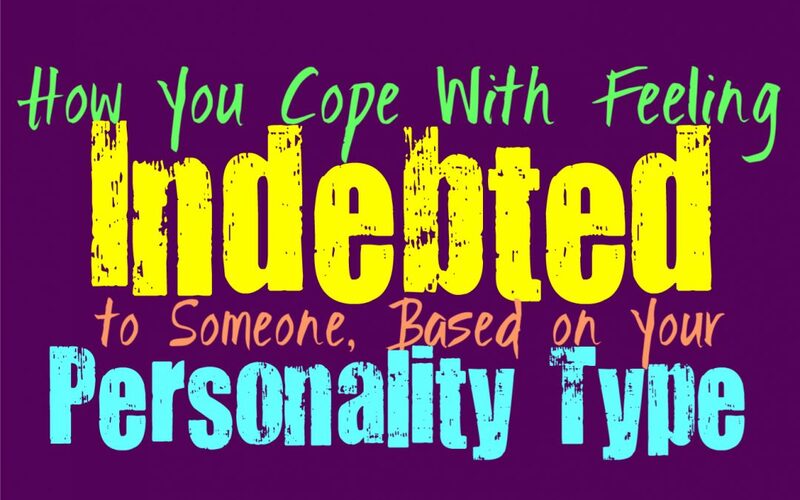 Here is how you feel about being indebted to someone else, based on your personality type. INFJs don’t like owing people, since they don’t like feeling as if they are a burden. For the INFJ it isn’t that they don’t want to be connected to others in this way, it is more that they want to avoid being the person that is holding others down. INFJs work hard to be someone who helps their loved ones and make their lives easier. For them being indebted to someone else means they must find a way to constantly work towards paying that debt. If they love someone deeply they will simply want to show them their appreciation and work hard to make up for this debt. ENFJs really don’t like feeling indebted to others, since it makes them feel like they have failed in some way. They work hard to always be the strong one, and they don’t like when people see their weaknesses. ENFJs can be perfectionists, and to uphold this idea that they are perfect and capable they must never be indebted to others. When the ENFJ receives help from someone they do whatever they must in order to repay that debt, plus a little extra just to be sure. They would rather be the one that others turn to when they are in need, and do not mind when people owe them in some ways. INFPs don’t really mind feeling indebted to people, as long as it is someone they trust. It can be challenging for them to owe someone who holds this over their head though, and will likely hurt the INFP deeply. They realize that helping each other out is valuable and that just because someone was there for you it doesn’t mean you are instantly indebted to them. For the INFP it isn’t right when people feel the need to obligate others to them simply because they offered their help. They would rather not keep a score of debts, and prefer to live life with more of an openness and sense of consideration. ENFPs don’t mind receiving help from others, and certainly don’t mind that they owe them in some ways. For the ENFP the struggle comes from people who hold this over their heads and make them feel bad about it in some ways. They would rather not live their lives constantly keeping score of everything they do or have done for them. ENFPs prefer to be around people who simply do things out of the kindness of their hearts, and don’t feel the need to call the ENFP out on what they owe. INTJs truly dislike feeling indebted to someone else, and so they do whatever it takes to pay those debts off. If someone helps the INTJ with something they will want to find a way the pay them back rather quickly. They dislike feeling as if they owe someone, in most cases they try to avoid this entirely. INTJs usually do things themselves and rarely ask others for help, often because they dislike feeling a sense of being indebted to someone else. ENTJs often try to avoid feeling indebted to others, and will work hard to take care of their own troubles. For ENTJs it is not worth it to feel constantly indebted to someone else, especially since many people will hold this over their heads. ENTJs value a sense of control in their lives, and so they work hard to pay off any debts as quickly as possible. If there is someone who feels the ENTJ owes them they will not be able to just put this out of their minds. INTPs definitely don’t like feeling indebted to others, but this is something that happens when people feel the need to hold things over their heads. INTPs prefer to be around people who do not become entitled when they do something nice for someone else. They would rather not keep a constant tally of debts when it comes to simply helping out a friend or loved one. They will work hard to pay off any real debts they owe, but become annoyed with people who constantly feel like the INTP owes them for something. ENTPs don’t like when someone tries to hold things over their heads, since they prefer to feel a sense of freedom in their lives. They don’t like feeling indebted to others, and will do whatever it takes to make this right. In most situations the ENTP will avoid asking for help, and instead will try to handle things themselves. They usually try to avoid getting themselves into situations with people where they will constantly owe them for something. For the ENTP these types of people are annoying and usually not people they want to have in their lives. ISTJs work hard to pay off their debts, and will do whatever it takes to make things even. They aren’t the type of people who want to go above and beyond with what they owe though, instead they want to make it fair. They believe in doing things the right way and ensuring that their actions area equal and justified. If the ISTJ does owe someone they will pay back their debt and make sure everything is squared away. When it comes to family they might become annoyed with the idea of debts though, since they often feel they should work together. ESTJs believe in ensuring that their debts are paid off, since they dislike feeling as though they owe someone else. For the ESTJ it is important to make sure things are fair and so they do their best to stay on top of any debts that must be paid. They also become annoyed when others owe them for something, and will want to make sure that situation is rectified. When it comes to their close family the ESTJ often feels different, instead they believe in working together as a team and not constantly keeping count. The joint effort is a sense of fairness that the ESJT believes is important in a family situation. ISFJs often believe in fairness and ensuring that all of their debts are paid. They might even go above and beyond with their loved ones, so that they don’t ever feel like they owe them something. ISFJs would rather be the ones constantly helping others, instead of feeling like they are the burden who is in need of assistance. For the ISFJ it is important to ensure the happiness of their loved ones, and so they strive to always refrain from being indebted to others. ESFJs don’t enjoy feeling indebted to others and will often do their best to avoid this entirely. They prefer to be the one who others owe, since they don’t like feeling like they have failed them in some way. ESFJs don’t enjoy keeping a constant count but at the same time they don’t like being constantly indebted to others. For the ESFJ it is important to take care of their loved ones and to be the person that others can completely rely on when they are in need. ISTPs don’t like feeling indebted since it takes away their sense of freedom. For them it is about feeling like someone else has control or power over them, and this isn’t something ISTPs enjoy at all. They want to have the freedom to make their own choices without having people try to control them in any way. ISTPs usually try to take care of things themselves in order to avoid feeling like they owe others, and so they don’t often ask for help. ESTPs don’t like feeling as if they owe someone or are indebted to them, and so asking for help can be hard for them. Sometimes the ESTP will ignore these debts, and might feel like their own actions have evened things out. They can sometimes exacerbate their own accomplishments, in order to avoid feeling as though they are indebted to someone else. They prefer to be around people who don’t constantly keep some sort of tally of debts owed, since this helps them feel a stronger sense of freedom in their relationships and their lives. ISFPs don’t mind asking for help, but they don’t like when someone holds this over their heads. For them it is more about being connected to their loved ones and feeling as if they have people they can rely on. ISFPs don’t feel like keeping track of everything they do for others is necessary and so they dislike when someone feels like the ISFP owes them. They would rather have more freedom and openness in their relationships, and a sense of understanding and trust. ESFPs can become annoyed with people who feel this need to keep a constant tally on debts owed. They prefer to be free in their relationships and spend time with people who don’t need to constantly be paid back. ESFPs will do a lot for their loved ones, but they don’t usually keep track of this either. For them it is more comforting and enjoyable to have relationships where debts don’t exist, and both people simply enjoy living in the present together.